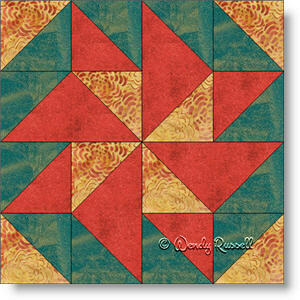 The Catch Me If You Can quilt block is a four patch that is a perfect choice for a beginner quilter. It contains only half square triangles and flying geese units -- the first pieced patches you will learn as someone new to quiltmaking. Colour choices and placement can have a big impact on the resultant quilts you might design using this quilt block, as evidenced below in the two sample quilts illustrated. This just reinforces that easy blocks do not necessarily equate to boring blocks.